Preheat oven to 180°C (350°F). Place the coconut milk, coconut sugar, vanilla and water in a 28cm ovenproof frying pan over high heat and cook, stirring, for 5–6 minutes or until the sugar is dissolved and the mixture has just come to the boil. Place 2 tablespoons of the caramel in a small bowl and set aside. Place the flour, baking powder, coconut, cacao nibs, caster sugar and butter in a medium bowl and rub the mixture together with your fingers to combine. Add the buttermilk and mix until just combined. 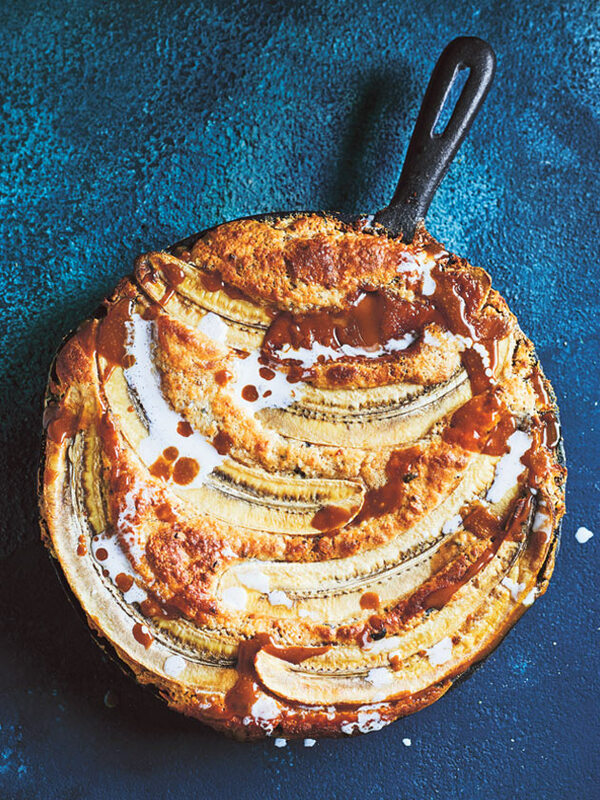 Spoon the topping over the caramel and top with the bananas. Place the pan on a baking tray and cook for 30 minutes or until bubbling and golden. Drizzle with the reserved caramel and extra coconut milk, if using, and serve immediately. Serves 6. This was better than I could’ve imagined! So delicious, with fabulous textures. I used dark brown sugar instead of coconut sugar, and regular caster sugar.